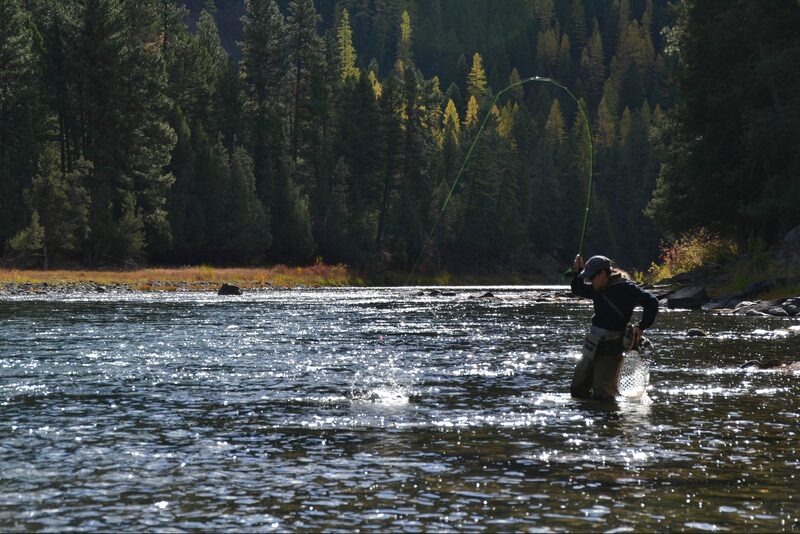 Two things I don’t want to have to choose between are fly fishing and spending time with the pup. Luckily, they can go hand in hand. 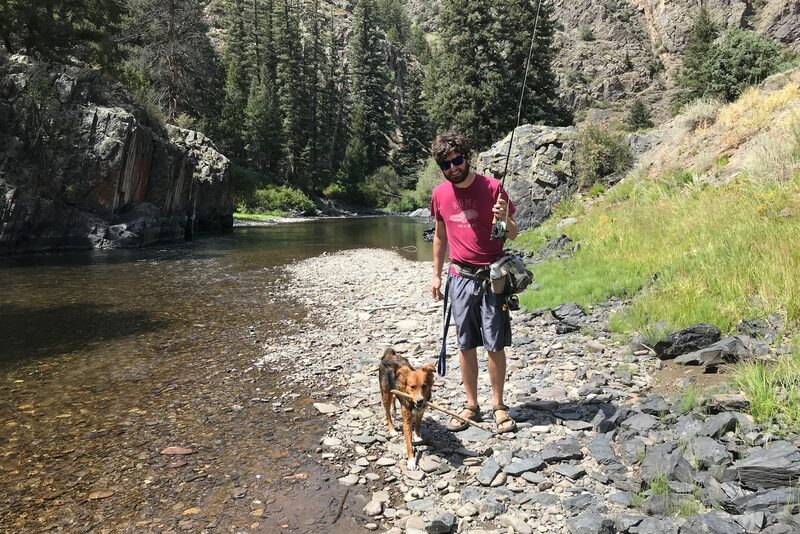 Bringing a dog fly fishing isn’t the easiest way to get on the water, but it can be a ton of fun for both you and your best friend if done right. Some of what it takes to bring a dog fishing will depend on the breed or the individual dog’s personality. Some will be natural fishing dogs, ready for the water and well-behaved while you fish. Others take hours of training and, even then, might not be easy to keep around on the water. If you have a dog who’s ready to join you on your adventures, keep these tips in mind when you decide to hit the water. If your dog is perfectly trained and never disobedient, this isn’t that important. However, how many dogs do you know that always listen? Plenty of river access points are along major roads. Since it’s fairly likely your dog won’t be on-leash the entire time you fish, it’s important to keep busy roads in mind when choosing a spot. In the middle of nowhere, it’s probably not a big deal if your pup wanders a bit. If you’re along a highway, he’ll need to stay much closer to you. We like to avoid taking our dog fishing along major roads altogether, because keeping that close an eye while fishing gets old. When picking a spot, you need to keep in mind whether you’ll be able to stay on one side of the river or need to cross it throughout the day. While having to cross a river certainly doesn’t exclude it as a dog-friendly area, some places will probably be too rough. 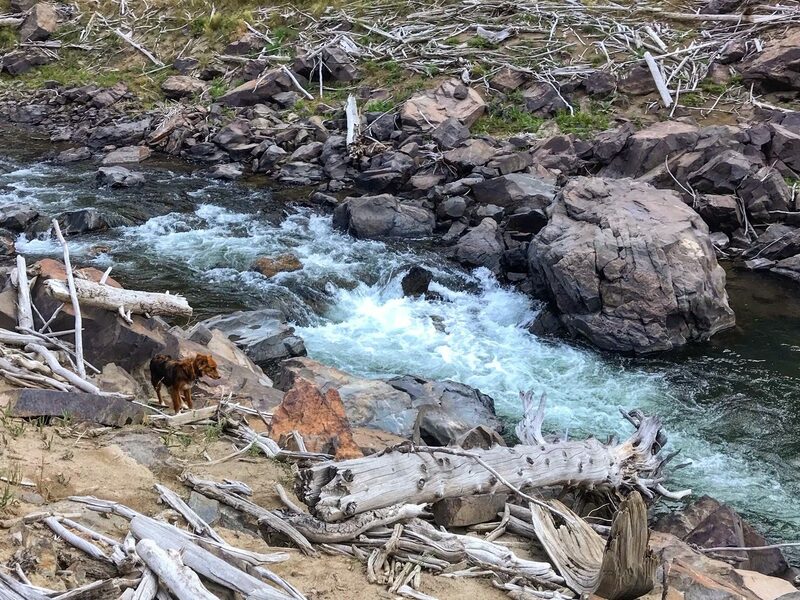 Even if you can cross small rapids, your dog might not be able to, and if he’s too big for you to safely carry across, it’s probably better to pick a shallower spot or somewhere that doesn’t require crossing. Again, with perfectly obedient dogs, this might not be a problem. But, most dogs aren’t perfectly obedient. Taking them to places where you’re shoulder-to-shoulder with other folks will probably be stressful for you and everyone else. Plus, even if your dog stays beside you, people who aren’t fans of dogs may not be super cool with yours being there. If possible, choosing lightly-trafficked spots is a better option. Some places are not ideal for a doggie river crossing. There’s no perfect list of commands your dog must know in order to go fishing. Making sure he knows the basics is important, though. Although some dogs will naturally be well-behaved and stay by your side, most will want to roam a little and explore. If that’s the case, you’ll need to be able to control their movements from afar. These commands allow you to control where you dog goes and what he interacts with on the river. Treats have two main functions on the water. First of all, they go hand-in-hand with your commands. If your dog knows he’ll get treats, he’ll be more likely to obey. Even dogs that know the command to come may get excited when they see another angler and conveniently forget to obey. But, if they know there’s a reward waiting for them when they listen, they may suddenly remember what to do. Additionally, treats may help a frightened dog be more comfortable fishing. Ours used to be terrified of water and would run at the first sight of it. If your dog is nervous around water or isn’t comfortable with you wading out and leaving him on shore, offering treats can ease the pain and make him associate fishing with tasty snacks. Some dogs are natural swimmers. Others have no idea what to do in the water. You’ll want to know which type your dog is before letting him loose by the river. 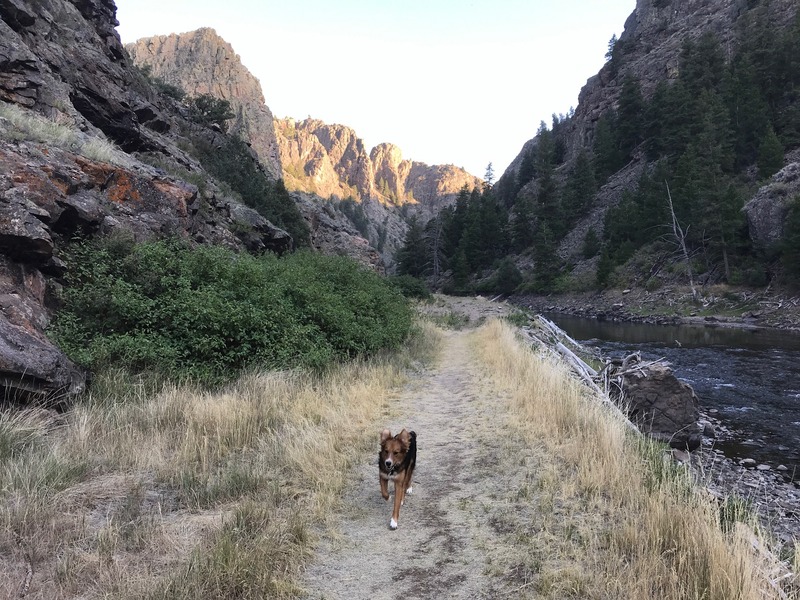 If you’re fishing a tiny stream, it’s probably only important for your sake: if you cross, you may not realize that your dog didn’t follow you, and you’ll have to go back and get him. If you’re on a big river, however, a dog that can’t swim could be risky. A slip into the water or an unexpected deep spot could send him downstream. If you know your dog has trouble in the water, make sure you pick a spot he’ll be comfortable with and keep a close eye on him while he plays. We’ve all accidentally hooked ourselves during a fly cast. It’s usually not a problem and hooks can be easily removed. Every so often there’s a bad one though, and this is important for your dog, too. Since he can’t let you know every time he crosses behind you, making sure you have the all-clear before backcasting is a must. Keeping flies off the ground is important, too. It’s also not a bad idea to pinch your barbs if you’re taking a dog along. Even with careful attention, accidents happen, and your pup will be much happier with a hook that slides out than one that’s catching skin every time you try to remove it. You’re probably having a great time every time you fish, but you may need to convince a dog that he’s having just as much fun. Getting to the river and immediately ignoring him may cause boredom if he isn’t good at entertaining himself. 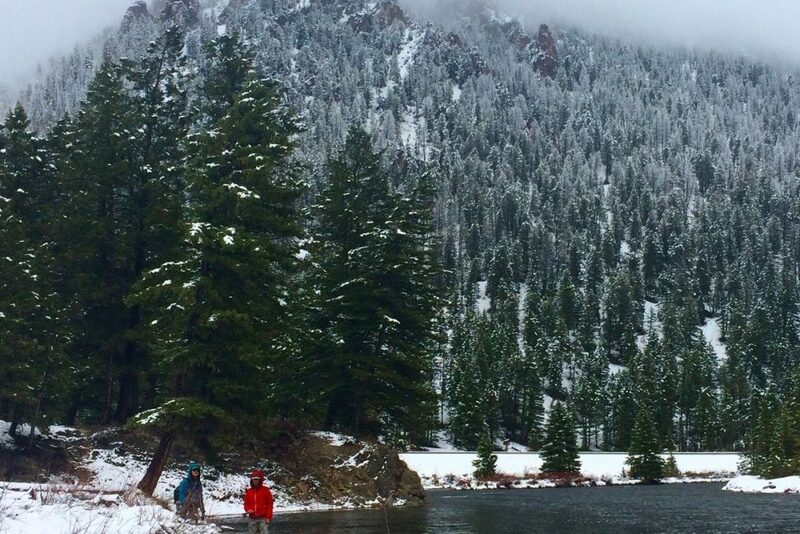 There are plenty of ways to make fishing fun for your best friend. You can bring a toy along (or just throw a nice stick every now and then), make some time to splash in the water after you’ve fished through a hole, and show the dog what you’ve caught before you release anything. Lots of dogs are intrigued by fish. When we keep fish, our dog also likes to lick them after we clean them. We’re grossed out by her fascination with dead fish slime, but hey, it makes her happy. 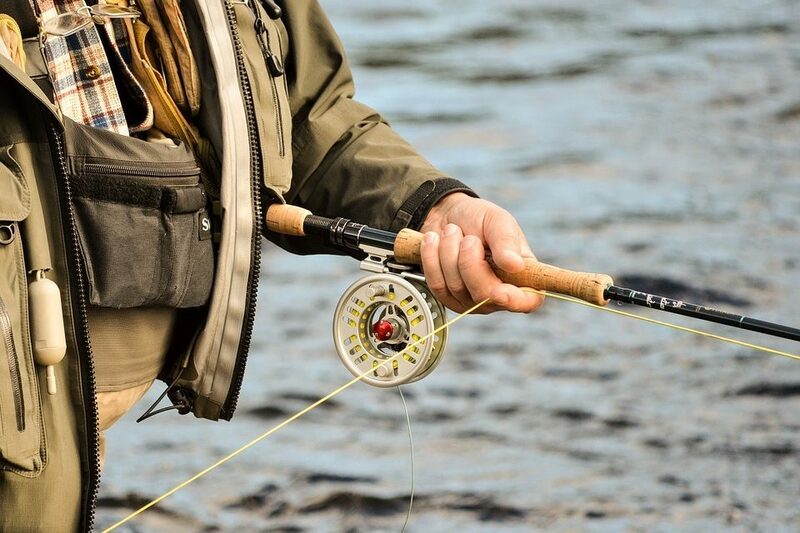 Fishing is always much easier and more enjoyable when you’re prepared, so having these things available will make the process of bringing a dog seamless and simple. Do you like to take your dog fishing? What are your favorite tips for keeping them happy and healthy on the water? Previous PostWild vs. Native Fish: What’s the Difference?